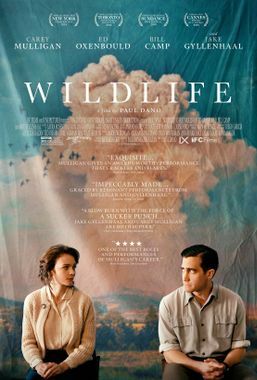 The Critic’s Week opened this year with the remarkable Wildlife, first feature film by actor Paul Dano (Little Miss Sunshine, There Will Be Blood, Youth, Okja). He wrote the screenplay with Zoe Kazan, the grand-daughter of Elia Kazan, and it is an adaptation from the book by Richard Ford. In a director’s statement collected by Charles Tesson for the Critic’s Week catalogue, Paul Dano says he was empowered by what Richard Ford told him when he asked for the permission and the rights to adapt the book for the screen: “I’m grateful to you for your interest in my book; but I should also say this – in hopes of actually encouraging you: my book is my book; your picture – were you to make it – is your picture. Your movie-maker’s fidelity to my novel is of no great concern to me. Establish your own values, means, goals; leave the book behind so it doesn’t get in the way.” What a great lesson on how to adapt a book, and what a great way to start the long process of making a feature film. I’d say that Paul Dano did an excellent job following that piece of advice. The film is very personal, this is a very personal statement. It is brilliantly directed. Paul Dano and his producer Alex Saks have chosen the right people to work on this film. The image by Diego Garcia is beautiful, and together with the mise-en-scène, conveys an intimate feeling, making us be part of this family, its desintegration, and its reconstruction. Also, the point of view is almost always of Joe, the pre-teen son. We sees what he sees, and we feel what he feels. The music by David Lang reinforces the mood of something falling apart, and the choice of where to put music and where not is very accurate given the type of story and its arch. The actors are amazing. Carey Mulligan (An Education, Drive, Shame, The Great Gatsby, Sufragette) portrays Jeannette Brinson, the mom, and confirms once more her talent and the cleverness of her choices as to which projects to be involved with. Jake Gyllenhaal (Brokeback Mountain, Zodiak, Brothers) portrays Jerry Brinson, the dad, who is unable to face the challenges that arise in his relationships with his wife and son, and chooses to run away to fight a fire rather than confront his own demons. Jake Gyllenhaal is excellent in this film, and find the right dosage between a sort of mutism when running away, and the intensity of his anger when he comes back to find that the family has desintegrated. Ed Oxenbould, who portrays Joe Brinson, the son, is amazing and carries the film on his shoulders. He is the witness of this story, we see it unraveling through his eyes and emotions, and he is always completely truthful. Not only has Paul Dano managed to do that, but he did so much more and shares with us a film that is extremely well made, is indeed personal, and very moving. I can’t wait for his next film!